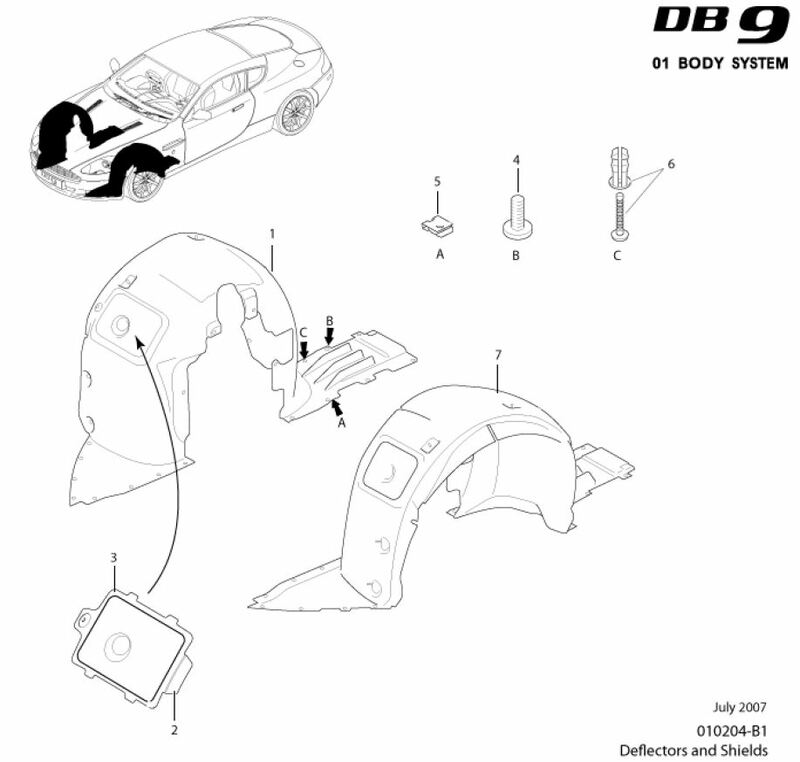 Several service issues on your DB9 require you to remove the plastic inner wheel well arch liner so you can access hidden components. The most common reason is when you change your Air Filter as part of an annual service. The technique is the same for both the right and left sides. The only tool you’ll need for this is the same T30 Torx socket that is used for so many tasks on the car. Once I had the car off the ground and wheel removed, I removed the four T30 screws along the front air dam first. These might be painted to match the color of the car. Then I crawled under by the jacking point and removed the three T30 screws in this area. Finally I worked methodically inside the wheel well and removed 11 screws. I started on the ones that would be hard to see/reach first. This is deliberate, I didn’t want the liner falling and flopping around on me while I struggled with the hardest screws. I did the two easiest to reach screws last, the ones just fore and aft of the coil spring. Once all the screws were removed, its just a matter of wrestling the liner out of the space. 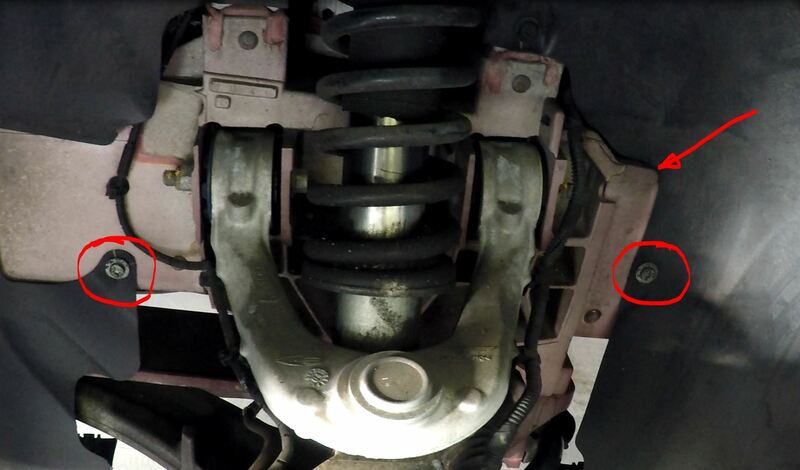 There is a small ‘lip’ just in front of the coil spring I had to lift it off of first. I then worked the front half of the liner loose, then the rear section, and finally I eased it out of the wheel well. Once it was out, it was interesting to note the blanket of insulation/padding (?) on the back of the piece. Not sure what this is for, it’s not attached tightly enough to the plastic to really be an effective sound deadener. Anyone really know what this is for [please leave a moment]? If it was just for sound attenuation, might it be better to remove this stuff and replace it with Dynamat stuck directly to the entire back surface? In a few places the tape used to hold it to the plastic liner was failing (I’ll repair that later with some new double sided outdoor rated tape). While I had it off the car, I used my pressure washer and gave the liner a serious deep cleaning. Once it was clean, I used some Meguiar’s Ultimate Black Plastic Restorer to make the liner look as good as new again. I would suggest you check out my video on the process to get a better feel for how to wrestle it out. Check out my bonus post on what you can find behind the wheel arch liners. Often its useful when planning a service to see how you can get to stuff before you start. 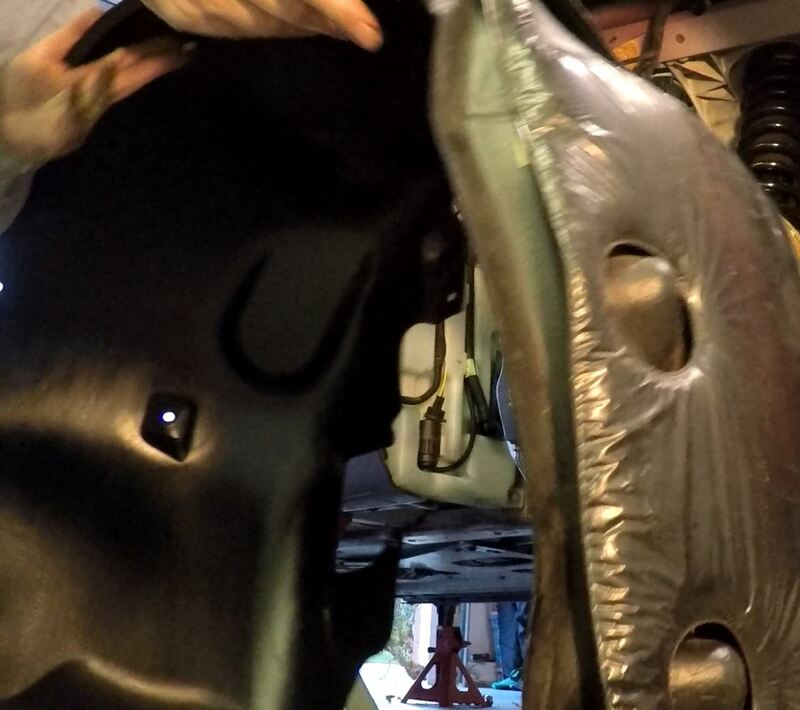 And here is my post and video on how to re-install the wheel arch liner. I am wondering, if you’ve ever had to change the running-light bulbs in the extrem front of the light assembly. Not the turning lights. The light bulbs in question are situated in the extreme front under the “fresnel lens type” portion of the light assembly. A mechanic told me, that I would indeed have to take out the wheel liner, as you did, to get to it. I have a 2008 Aston Martin DB9 (it came off the line on January 9th, 2008) and it is quite irritating to have the light out, especially if the other side is still on. Quite embarrassing on such a car. I understand and share your feeling – one light out looks odd. I haven’t had to tackle this myself, but a quick peek in the Official Aston Martin workstop manual outlines the steps as: 1) remove road wheel 2) remove wheel liner 3) remove air box (for air filter) 4) undo the 3 mounting screws for the entire headlight assembly 5) disconnect the 3 wiring harnesses that connect to the headlight assembly 6) disconnect the wiring harness from the air inlet pipe (it’s in the way) 7) now carefully remove the entire headlight assembly and you’ll have access to change the bulbs. Wow! And, the part that makes me more nervous is that after reinstall, you should carry out a headlamp alignment. All of this is definitely doable. If I was doing it, I’d also probably change the yellow/orange turn single bulb and the marker light bulb you are after to both LED bulbs so you’ll never have to go to this hassle again. Thanks so much for the detailed explanation. It sounds like a road map to China. The only work around I have at the moment, is to only drive during daylight. 🙂 Your explanation did bring up one interesting further question. You spoke of an official Aston Martin Repair Manual. Can that be bought somewhere? Am glad I found you via the British Aston Martin Owners’ Club. … and yes, the DB9 does crack the 300 km/h mark on the Autobahn. Ciao and have a good remaining weekend. would it be possible for you to let us know the part number for that front running light bulb? Hi Lutz. I’m not sure what it is, I’ve not had mine out. Have you had any problems with cracking noice from the Steering colum. When I turn the Steering wheel, there is this annoying cracking noise. I’m not sure, but I think it comes from the upper steering colum. Just wanted to ask before I take it apart. I’m not so fun of the idea to tamper with the airbag system. Since this is a squeak and not a cracking noise not sure if its your issue. It’s your steering (and your life) so maybe a Dealer visit is in order if you can’t spot the area making the noise. Hi Steve, and thanks for your reply. No it is not a squeak or rattle noise. A little difficult for me to describe. English is not my main language. I think I need to take it apart one of the days. Maybe it’s just a matter of a bit lubrication between the plastic tubes in the upper colum. I will let you know how it goes. Thanks again. I have a “whizzing” noise when I turn the wheel. I understand that “whizzing” is quite a subjective description and in the ear of the beholder. It isn’t annoying while you are driving due to the ambient background noises, but when parking and turning the wheel it is quite irritating.It sounds – and probably is – like two surfaces rubbing against eachother. I’ve had the thought of just blasting the interstitial space between steering wheel and column with some silicon spray, but am somewhat afraid to do that. I had this on my left front wheel well. What I found was that the small plastic wind deflector that is plastic riveted along the bottom of the arch liner in front of the wheel has one rivet missing on the outboard side, allowing it to curl in towards the wheel ever so slightly. I didn’t think it would make a difference, but it did. I used a self tapping pan head screw and replaced the rivet, and the whizzing noise went away when turning hard left. Maybe you have a similar issue. Good luck! had to smile a little bit, because I believe I was perhaps a little too non-descriptive. I was actually talking about the steering wheel. Sorry about that. I drove the Aston today to try and put into words, what it sounds like when I turn the steering wheel with low to no background (driving) noise. As you turn it, it sound like you are pulling a squeeze across an almost dry window pane. I am nearly 100% sure, it is not of metallic origin, but somewhat like an object turning within an almost dry plastic bushing. I may be able to solve it by spraying some silicone between the steering wheel and the steering column. Am just afraid, that I may hit some electrical contacts with the spray and break the contact. Crazy thought, but I am still afraid. Have you and/or some of the readers encountered this “whizzing squeak” while turning the steering wheel. Again, not at speed, but when turning the steering wheel end-to-end while parking, for instance. Would you happen to know if the front wheel arch liner pads are the same part # used for the rear wheel liners? The front wheel liner schematic doesn’t list the pad part #, but the rear wheel liner schematic does list them. Mine are starting to get tired, so looking to order some new ones. By pads do you mean the blanket like plastic covered things stuck to the back of the hard plastic liners? If so, I would expect they would be different due to the cut outs for the mount points. Wasn’t aware they are replaceable. Mine are a bit torn, and the tape had failed, but I reattached them with new 3M Scotch outside grade foam mounting tape. Yes, those silver pads in your photos that stick on the back of the liner. I was hoping they were an independent reorderable part. Hi Mark. I don’t sell parts, but I’d suggest you look at http://www.astonmartinbits.com and http://www.pacificmotors.com Good luck!